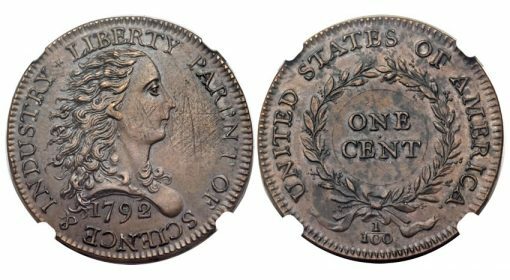 Two early American cents sold for a combined $869,500 in a sales event that was held in conjunction with the ANA World’s Fair of Money, Heritage Auctions announced on Aug. 11. A 1792 Silver Center Cent, named for a small silver plug added to its center to make its melt value equal its face value, realized $352,500. The cent is about the size of a modern quarter, with all but its center in copper. "The concept [of a dual metallic composition] was suggested by American patriot Thomas Paine and endorsed by Thomas Jefferson in a letter to President George Washington," Heritage describes. The second coin, a 1792 Birch Cent, realized $517,000. The rarity is the finer of two known examples with the experimental design. 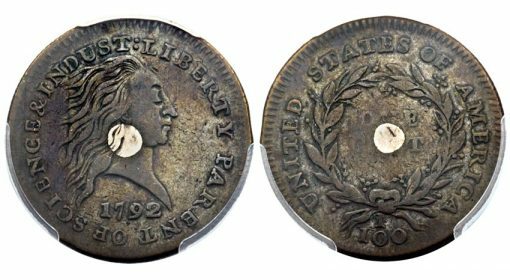 Heritage said the pair of rarities were among the most historically important coins to come to auction in more than 20 years. "As the first coins produced inside the U.S. Mint in Philadelphia, these two coins played an important role in the development of the United States’ monetary system," said Greg Rohan, President of Heritage Auctions. "Interest in these rarities extended well beyond the historical: Both are in excellent condition for their age and type." The cents were presented in Anaheim, California and online as part of a five-day public auction of rare coins and paper money. Heritage Auctions is the largest auction house founded in the United States and the world’s third largest, with annual sales of more than $900 million and over 950,000 online bidder members. To learn more about the company, visit HA.com. These two pieces are coinage patterns, not coins. Heritage, as the largest numismatic auction company, should know better to issue a press release with incorrect numismatic terminology. These are definitely museum-quality coinage patterns made before the first legal tender copper coins of 1793. Patterns ARE coins, Difference is..Do we strike them or not.Anybody in”The know” Know what they are.